Has Rod Stewart told you lately he’s sorry for making an ISIS-style beheading video? Some guys don’t have all the luck, it seems. How often have you been on vacation in Abu Dhabi, right in the middle of your massive world tour, and decided to cut loose with some silly social media videos? Just goofing around with your friends—havin’ a larf, as they say—and getting loose, maybe ordering an extra mimosa with brunch? It’s naturally the kind of thing that could lead to you and your buddies making some duck faces at the camera, for example, or all of you posing in that one position that always makes your brother crack up. Or just playfully reenacting an ISIS-style beheading in the desert, and then having your spouse send it out on Instagram. 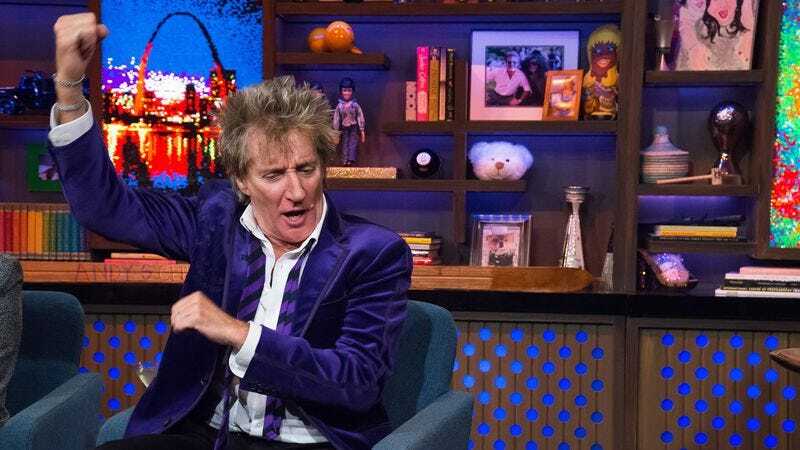 Unlike all those times you started to do that, only to think, “Maybe that’s not the most tactful move,” Page Six reports singer Rod Stewart actually followed through on that plan, and people suddenly want to talk about it very much, thank you. The singer, his spouse, and some friends—or possibly people paid to hang out with Rod Stewart—were in Abu Dhabi, and his wife Penny Lancaster shot a short video in which Stewart playfully walks across some sand dunes with associates. So far, so in keeping with the caption posted with the video, “Rod Stewart (leader) band doing a ‘Beatles’ sand dune crossing.” Aside from the odd need to assure everyone her husband is the leader, this appears to be a case of video and caption in perfect harmony. Of course, that’s before the video continues, with Stewart encouraging one of his mates to kneel in the sand, so that the singer—possibly while singing “First Cut Is The Deepest,” just for maximum shock value, GG Allin-style—can then make a cutting motion across the man’s throat. “Planking, imitating brutal terroristic acts, no matter—it’s ‘All For Love’!” they possibly then said, before uploading that short clip so the rest of the world could generate its honest emotional response. Originally, following the outcry, the video was edited to remove the offending section. However, looking at Lancaster’s Instagram feed, the video now appears to be axed altogether, though a subsequent photo op, showing husband and wife posing on a sand dune, is still up, leading to inevitable comments from followers like, “Nice relax after a beheading.” Stewart has released a statement apologizing for offending people: “From re-enacting the Beatles’ Abbey Road crossing to spontaneously playing out Game Of Thrones, we were simply larking about pre-show. Understandably, this has been misinterpreted and I send my deepest apologies to those who have been offended.” Indeed, who doesn’t love that Game Of Thrones scenes where the guy gets beheaded by a popular singer in the desert?